From Trenton back to London; from London to New York and then on to Elmira, the small airport local to Watkins Glen. 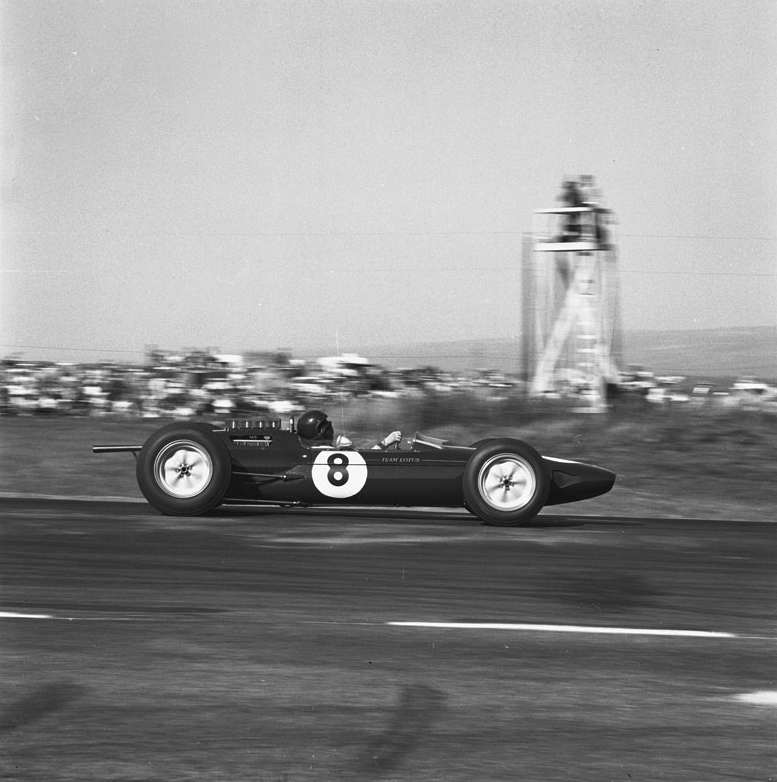 The 1963 US GP would be Jim Clark’s first as World Champion. Jim loved his days at The Glen; everyone did. The leaves had by now turned red and brown; there was a mist in the mornings that lifted only as the sun broke through before noon. 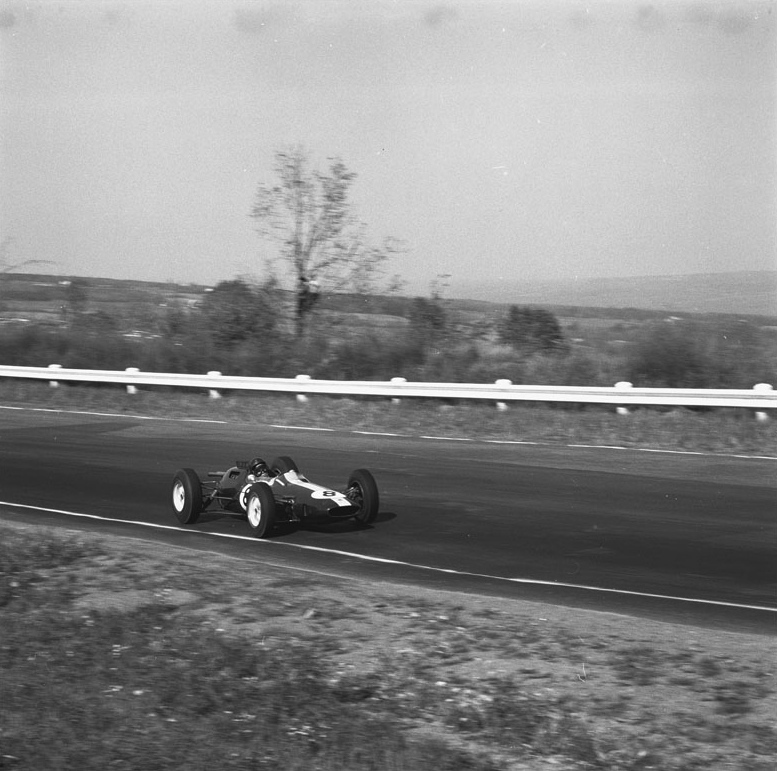 And this was a Grand Prix run by good, racing people – men like Cameron Argetsinger, who had brought motor racing to Watkins Glen in 1948, Media Director, Mal Currie, and Chief Steward, Bill Milliken. All had rich racing and automotive histories. Milliken had been a Boeing test engineer during World War II and had joined the Cornell Aeronautical Laboratory (Calspan) in 1945. As an avid Sports Car Club of America (SCCA) member and former driver/designer, Bill in 1960s and 1970s became the doyen of US automobile engineering research. He was, in short, the sort of Chief Steward in whose presence you doffed your cap. 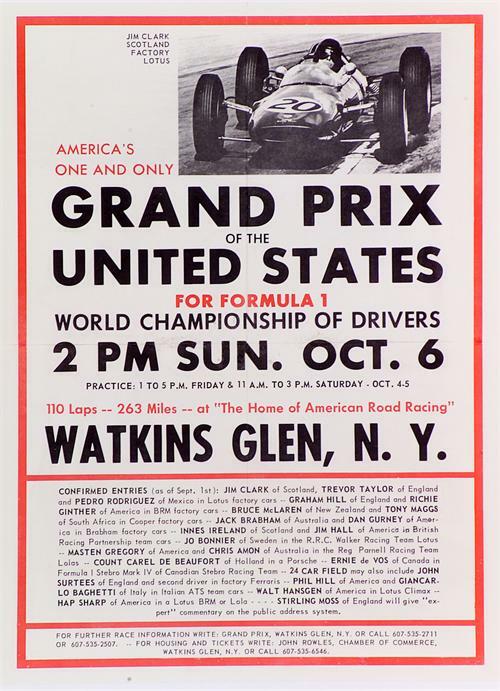 The drivers and key team people stayed nearby at the Glen Motor Inn, hard by the Seneca Lakes, where their hosts were Jo and Helen Franzese, the second-generation Italian couple who loved their F1. Legends were born overnight at the Glen Motor Inn – and even at the old Jefferson hotel downtown. Lips, though, were always sealed. Such was life that October week at The Glen. Ford made a big splash, too, this year of the Lotus-Ford at Indy. This was the US GP! Sixty thousand fans were expected. Cedric Selzer, hooking up with the Team Lotus “US guys” for this race, remembers the drive up from New York airport on the Tuesday before the race: “We were given the keys of a saloon, a coupe and a convertible and made our way out of the city, heading for Watkins Glen. When we stopped at traffic lights, people came over and asked us about the cars. We told them we’d got them from the Ford Motor Company but it took us three days to realize that we’d all been given 1964 models than no-one had seen before. Practice took place over eight absorbing hours, split between two four-hour sessions on Friday (1pm-5pm) and again on Saturday (11am-3pm). There was a bit of a fracas when, first, Peter Broeker’s Canadian-built four-cylinder Stebro-Ford began spewing – and continued to spew – oil around the circuit, and, second, when Lorenzo Bandini slowed down after a blind brow to talk to his sidelined Ferrari team-mate, John Surtees. Richie Ginther and Jack Brabham narrowly missed the Number Two Ferrari, igniting a bit of finger-pointing back in the pits and plenty of “I no-a speak-a di Eengleesh…”. Trevor Taylor, whose car caught fire in the paddock on Saturday, qualified seventh; and Pedro Rodriguez, having his first F1 drive, and fresh from a win for Ferrari in the Canadian GP sports car event, was 13th in the carburettor-engined 25. This wasn’t a happy weekend for Trevor: Chapman chose the US GP to tell him that he wouldn’t be retained for 1964. His place would be taken by Lotus’ FJ king, Peter Arundell. I recently bought an audio CD of the 1963 US GP and Stirling Moss provides an hilarious description of these moves whilst watching the start from the main control tower. Jim eventually lit up the rear Dunlops just as the last-placed car completed its first flying lap. He would finish a brilliant third behind the two BRMs of Hill and Ginther (after Surtees’ V6 Ferrari broke a piston in the closing stages) – but it could have been even closer. “That mishap on the grid was what I needed to put me back into a fighting mood,” remembers Clark in Jim Clark at the Wheel, “and so I set off after the field, knowing I was going to enjoy the race. I began to catch up the field, and to thread my way through, until I saw Graham Hill in front of me. I thought I was at least going to have a dice with my old rival, albeit with me being a whole lap behind him. This was not to be, for shortly afterwards the fuel pump started acting up and it became a struggle even to keep him in view. 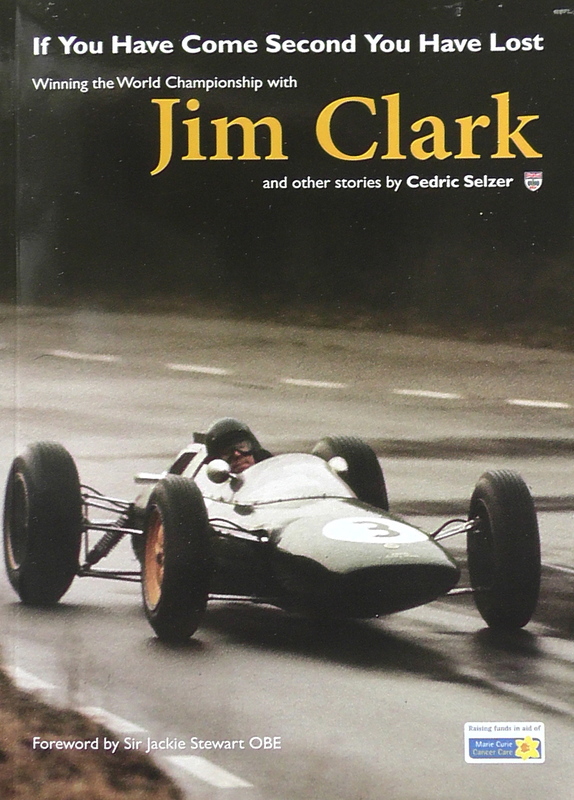 I ploughed on through the race, during which many cars dropped out, and finally finished third.” Jim didn’t know it at the time but Graham, too, had been in major trouble: a rear roll-bar mount had broken on the BRM. Even so, it is typical of Clark’s character that he should sum-up his US GP with the phrase “…and finally finished third.” He was given to understatement; his mechanical sympathy in reality did the talking. There was no podium at The Glen. As in other races back in 1963, it was the winner alone who took the plaudits and the laurel wreath (and, in the case of the US GP, the kisses from the Race Queen.) The new World Champion, after yet another astonishing race, would have quietly donned his dark blue, turtle-necked sweater, had a soft drink or two, helped the boys in the garage and then repaired to the Glen Motor Inn for a bath and a good dinner. The Mexican GP was three weeks away. On the Monday, Jim would journey back to New York and then fly across the continent to Los Angeles. Ahead, over the next two weekends, lay two sports car events for Frank and Phil Arciero, the wealthy (construction/wine-growing) enthusiasts from Montebello, California, who had already won many races with Dan Gurney. The first would be the LA Times Grand Prix at Riverside, where Jim’s “team-mate” would be his Indy sparring partner, Parnelli Jones. Then, the following weekend, he would race in the Pacific Grand Prix at Laguna Seca. 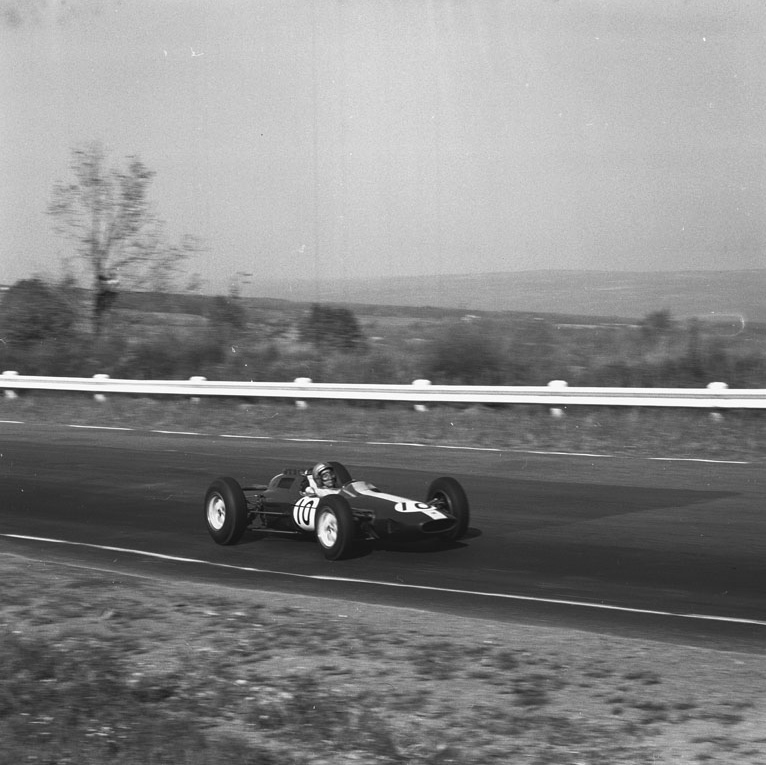 On both occasions he would drive the Arciero’s new 2.7 Climax-engined Lotus 19….assuming it was ready. On the radio in his room that night at The Glen, with the still, cool air from the Lakes reminding him that the European winter was but a step away, Jim might have heard the Beach Boys chasing their Surfer Girl, or Peter, Paul and Mary Blowin’ In The Wind. Ah the Glen! I attended the USGP there every year from 1974 til the last. I remember sitting on the outfield grass in the anvil during pre-race practice in 1976 on Sunday morning when Niki Lauda stopped to adjust his balaclava under his helmet. I wonder how many current F1 drivers enjoy themselves as much as Jim Clark did? So, fifty years on I finally learn exactly what happened that day. This was our first GP after moving from England and I was so looking forward to a “Jim demonstration”. What a blow as they came by – without him – on that first lap! The tech center was a draw every year that we went till the end. We’d always go late at night so we could absorb it all for as long as we wished. Watching “RUSH” I was reminded of some good pictures I have, in the tech center, of the BRM of a then unknown Niki Lauda. I live only a couple of hours from there now. It is October, and every now and then the smell of a wood fire will be on the wind and somehow I’m transported back to that wonderful place and the time of F1 at The Glen.